Find your daily dose of articles with our online poker news! The 2016 World Series of Poker Main Event drew 6,737 players, hitting a height not seen since 2011 and marking the fifth-biggest field to ever pack the Rio All-Suite Hotel & Casino for the event. That lofty number will be welcome news to many. The health of the game seems to constantly be a hot button topic among the poker community, and no evidence is used as a barometer for the current state of the game quite like the numbers in the WSOP Main Event. If numbers are down, buzz circulates about whether this issue or that is killing the game. If numbers are healthy, all is generally assumed well. If you want to learn more about poker, don’t forget to visit our How to play section! Many numbers in no-limit hold’em events were slightly down at the 2016 WSOP, fueling speculation that the Main Event would follow suit with a smaller field. In particular, the Colossus II failed to live up to the lofty standard set by its ground-breaking predecessor, as just 21,613 showed out after a turnout of 22,374 in the inaugural. That was despite the addition of two extra starting flights this year. If the WSOP Main Event numbers are any indication, players are still plenty excited about tournament poker and willing to show up in droves to fire the most prestigious tournament on the planet. Ready for start winning at poker? Bet NOW! Additionally, a new record was established with 4,240 players on Day 1c, making it the largest starting flight in the Main Event’s history. That bested last year’s Day 1c number of 3,963. Here are the numbers for the final starting flight of each WSOP Main Event since 2012, when the format was switched to the current three-flight model. Clearly, Day 1c has increasingly become the day of choice for Main Event players. 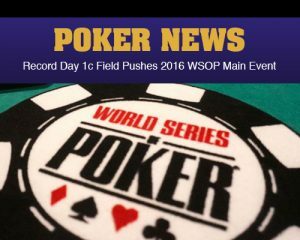 This year’s Main Event will also see a record 1,011 players walk away with payouts courtesy of the new 15 percent cashing format that’s been the standard at the WSOP in 2016. A min-cash is worth $15,000 and this year’s champion will walk away with $8 million in prize money. Become the best player that you can be! Get all the latest Poker News updates on your social media outlets. Follow us on Twitter and find us on both Facebook and Google+!